New proportions. 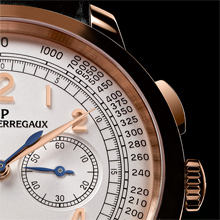 Performance guaranteed by Girard-Perregaux’s technical expertise. Perfect readability. 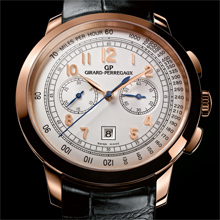 The Girard-Perregaux 1966 chronograph has now adopted a case with a diameter of 42 millimetres to make room for the measurement of short time periods. The model’s discreet, classic elegance blossoms on a new dial that extols the virtues of functionality. Thanks to its character and the excellence of its execution, the Girard-Perregaux 1966 collection has naturally established itself as one of the brand's icons. It beats to the rhythm of Manufacture movements and concentrates all the historical, technical and aesthetic craftsmanship of Girard-Perregaux. This new chronograph continues the quest for precision and reliability pursued by Girard-Perregaux, in terms of both function and style. 42 millimeters. A new diameter for this collection in response to demand from our clients. Girard-Perregaux has increased the size of the case while at the same time maintaining its pure lines, curve and horns that are carefully designed to hug the wrist. Crafted from pink gold at the Manufacture’s workshops, the case undergoes meticulous finishing work to reveal the brilliance of the noble material, without ostentation or compromise. The dial in this new layout proposes the date at 6 o’clock. Silver-plated, it remains faithful to the classic, timeless elegance of the collection. With an elegant central second hand circling above it, the dial presents a tachymetric scale on its external circumference, highlighting its technical character. Two counters face one another at 3 o'clock and 9 o’clock. 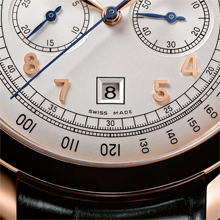 The leaf-shaped hour and minute hands indicate the applied Arabic numerals in pink gold. If it demonstrates subtle refinement in its production, the dial also offers an optimum time display. Behind the scenes, a Girard-Perregaux manufactured self-winding mechanical movement is at work. Equipped with a power reserve of over 46 hours, it boats an oscillating weight in engraved pink gold whose beautifully-crafted decoration is visible through the transparent case back. The product of over 220 years of watchmaking experience, the movement comes from the famous calibre 3000 family that is at the root of the Girard-Perregaux 1966 collection.